Wow! This is a great deal for Moms and Expectant Moms. Hallmark is offering a printable $10 off any purchase of $10 at Hallmark Gold Crown stores. 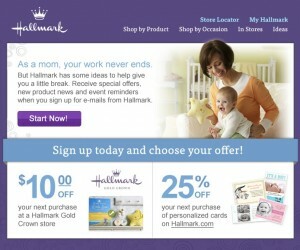 All you need to do is, sign up for Hallmark emails and you can choose between the $10.00 off $10.00 coupon or 25% off your next purchase.